December is truly one of my favorite months of the year, because it’s time to look back on what we’ve accomplished so far and look ahead to what we hope to get done in the coming year. One of my favorite thing to do in December is set my goals and daydream about how to make this next year the best year ever. In today’s video, I’m sharing my Top 5 tips on How To Make 2019 Your Best Year Ever As A Writer. Know Where You Want To Go: Having a clear vision of what you want your life to look like and how you want to feel is vital to having your best year. It helps to clear away all the distractions and really look deep inside yourself to find out what you really do want. Be Realistic: As writers, many of us have this chronic problem of biting off more than we can chew or ridiculously overestimating how much we can get done in a year. To make 2019 your best year yet, it’s time to get realistic about how much time you have and what you can get done. This will help you to focus in on what truly matters, rather than expecting yourself to magically be working at max capacity for all 365 days of the year. Focus on Joy, Not Fear: When we focus on the scary parts of being a writer (like actually, you know, finishing the book and giving people the chance to criticize it), we tend to sabotage our own plans. Instead, when you start to notice patterns of self-sabotage or you start to hold yourself back due to fear, try flipping it on its head and focus on the joy of creating instead. Whenever you feel fear, stop and think, instead, of what makes you happy and why you are writing in the first place. Surround Yourself With Positive People: It’s pretty much impossible for anyone to be positive all the time, but if you get in the habit of surrounding yourself with people who truly have your best interest at heart (and also distancing from the people who don’t), you are setting yourself up for massive success. Having a support system of people who want to see you succeed is truly priceless. Be Deliberate and Intentional About Your Time: For me, this tip kind of wraps it all up into one. Once you know what you truly want, have set up a realistic schedule for your life, it’s time to be deliberate about where you choose to spend that precious time you do have. No more throwing spaghetti at the wall or being a slave to every single distraction that comes along. Figure out what matters most to you and focus your time there. Create a plan that sets you up for success, and you’re going to have your best year ever. 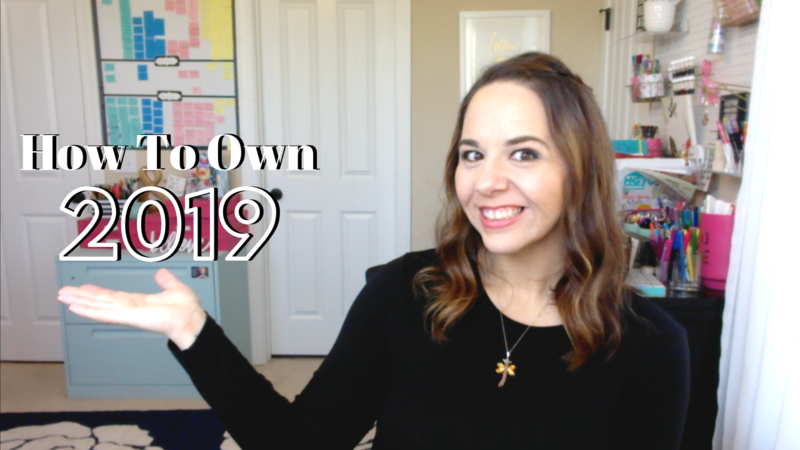 If you want to go deeper with these five tips and get some help and support setting up your own plan for 2019, I would really love to have you join my HB90 Bootcamp. This is a 3-Day Intensive Bootcamp where we will examine your ideal vision for your life, prioritize everything on that massive to-do list in your head, and create a plan to truly make 2019 your best year ever. Read more about the program and what we will do here. Right now, I’m offering $30 off and free Q1 printable HB90 Planner if you join the Bootcamp using the code “30OFF”. The link above should already have the coupon applied for you, but if you don’t see the discounted price use that code to get it! The Bootcamp will begin with a Live Kickoff Call Thursday, December 13th at 8PM Eastern Time and go through the 16th, but even if you can’t attend the course that weekend, once you’re registered, you’ll have access to the course and all the videos for life! That means you can go through the videos in January if December is just too busy for you right now. I’d love to have you join us now! Or, if you’ve been waiting for my HB90 Planner for Q1 to go live, it’s available now on Etsy! I’ve also added an undated planner you can print and use over and over again. Also, I’ll be doing a YouTube Live over on my channel this Saturday, December 8th, to walk through how to set realistic writing goals for 2019. If you want to join me, make sure you’re subscribed to my channel and have your notifications turned on.